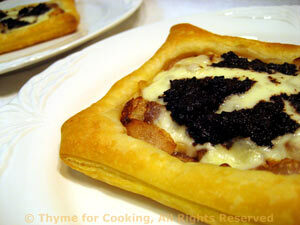 Goat Cheese and Tapenade Pastry, Thyme for Cooking first course. Sweet onions, tangy goat goat cheese and salty tapenade... Pour a glass of something fruity. 3oz (90gr) goat cheese You don't want the creamy kind in the carton for this but a proper goat cheese: log-shaped and wrapped in paper. It will have a thin, whitish, rind that is edible. Heat oil in medium nonstick skillet over medium heat. Add onion and sauté until transparent and tender, about 7 minutes. Turn heat up and cook, stirring, until they start to get brown, about 5 minutes longer. Turn heat to medium low, add sugar and stir until sugar is melted and evenly distributed. Let cook over medium low heat until very brown, 10 - 15 minutes longer, stirring occasionally. Cut goat cheese into 1/4" (.6cm) slices. Lay out puff pastry and cut two squares or circles, 4 - 5 inches (10 - 12cm) each. Lay the cut pastry on a baking sheet and, with a table knife, score a line around the edge of each pastry, about 1/3" (1cm) from the edge. Divide the caramelized onions between the two, spreading to the scored lines. Lay the goat cheese on top, cutting smaller slices, to roughly cover the onions. Spread tapenade on top of the goat cheese, dividing evenly. Bake in a pre-heated oven at 400F (200C) for 12 - 15 minutes, until sides of pastry have puffed around middle and are golden brown.